Firstly, just thought I’d say - I love Chinese Pod, Thanks! In regards to my suggestion, I currently don’t see any kind of visual indication on the main lesson choosing window [for example on this page] that I have ticked the “Lesson studied button”. While it does indicate this once you have clicked into the lesson itself, it would be very useful to see which ones have been studied from that main lesson selection launch page. If you use the dashboard filter you can see a green ticked arror for studied lessons, and a blue bookmark for bookmarks. 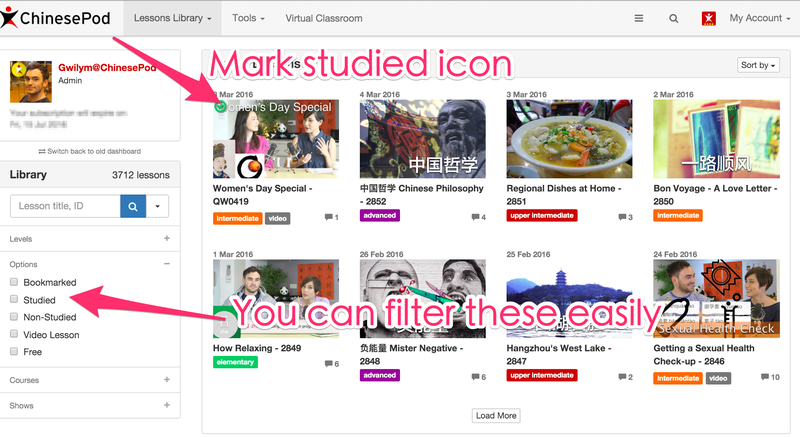 You can use the side menu to filter those lessons as well. Brilliant - This is exactly what I was after! Has this interface been around for a while? Definitely my new favorite way of navigating through the website.